Anne E. London can't remember the day she decided to be an artist. "I have always known, even as a small child, where my destiny was headed," says the wildlife artist. Her artistic abilities were apparent at an early age when she began selling her artwork professionally in Los Angeles during junior high school. She graduated from California State University, developing her artistic talents under the tutelage of renowned artist and educator Saul Bernstein. During her early career in movie studio graphics design, Anne began working with the actress Tippi Hedren doing storyboarding and logo design. Hedren founded the Shambala Preserve, a refuge in California for big cats, elephants and many other endangered species. It was then Anne first realized she could meld her artwork with her love for animals. In the decades since, she has developed a remarkable career as both an internationally recognized artist and a champion of animal conservation. "The commercial art world was not for me," Anne says. "All I could think about was these animals and the problems they were facing as a species. I wanted future generations to be able to experience the magnificence of seeing these beautiful animals living in their native habitat." Anne's immigrant parents encouraged her to expand her talents as they explored their new country and its wildlife. Her combined interests in arts and animals have taken her to Africa, Asia and across the Americas in pursuit of her subject matter: endangered species. Through her frequent visits to wild locations, Anne witnesses animals firsthand and records the face of nature through her "Portraits of the Wild" series. She draws only what she sees and viscerally feels from the animals' perspectives while immersing herself in the natural surroundings. 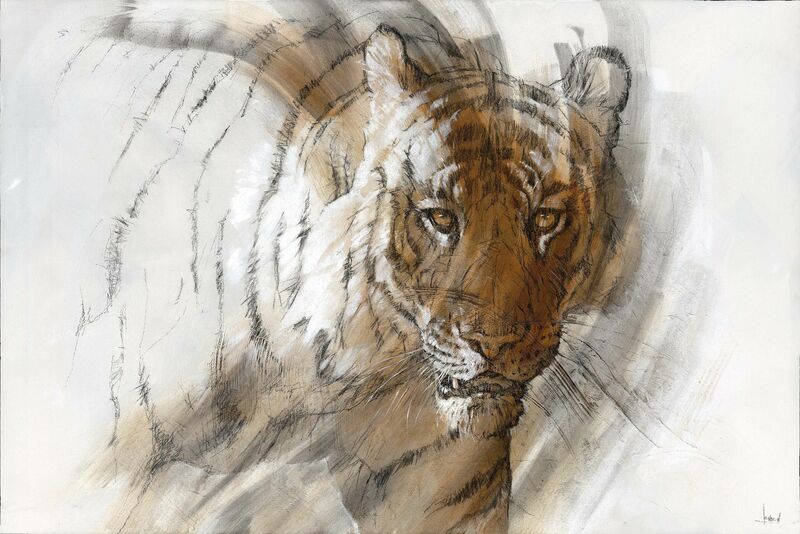 Now in her fourth decade as a fine artist, Anne has expertly used her work to raise money and awareness for endangered animals. 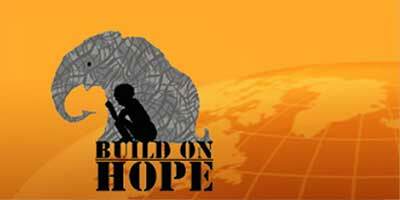 She is active in several animal conservation organizations and serves on the board of directors for the Project Hope Foundation. 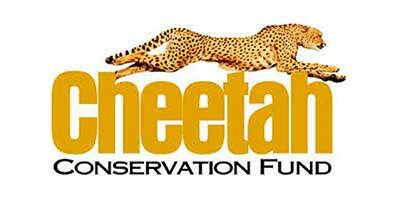 The International Rhino Foundation and the Cheetah Conservation Foundation have both named her as a signature artist and designer of their fundraising images. Anne's early work was predominately engravings ,known as "Intaglio" or "scratchboard" art. Intaglio is an artform perfected in the 13th and 14th centuries in northern Italy and Germany. It is a form of direct engraving on a specially prepared surface. The flat, rigid surface is sanded smooth and a layer of thin white clay is applied. Then a layer of the deepest black ink is laid over the white . The image is then created by meticulously cutting through or "scratching"through the black layer to reveal the white underneath. These clayboard etchings are considered by most artists to be the most difficult medium. It takes a strong ,steady hand to to maintain the perfect pressure, depth of cut and angle of exposure of the white clay substrate needed to create an image. Since each cut cannot be erased or painted over- mistakes are difficult, if not impossible, to correct. It is a slow and exacting process, with each image composed of hundreds of thousands of cuts into the surface. Working in scratch board is the reverse of classic artistic technique, since material is removed or subtracted to create the image. 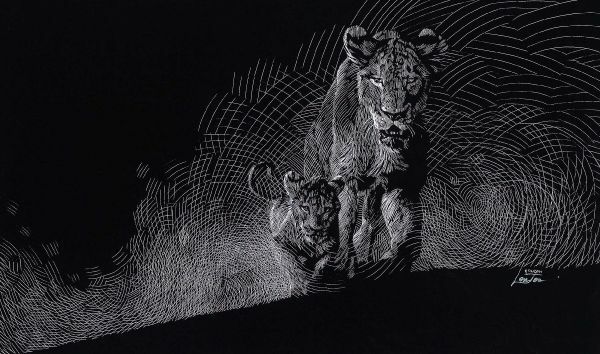 So, " Intaglio"or "scratchboard" is all about light, and Anne's mastery of light. "I loved the classic, stunning effect of engraved art, but the process was just too wearing on my body," she explains. "It was an obstacle that turned into a blessing when I saw how my artistic expression changed and how much more alive my art became. For the past 17 years, Anne's work uses graphite, charcoal, watercolor and organic pigments to convey the intracacies of light. Anne regularly visits Africa, returning with her field sketches to inspire the next year's work. "When I look at a lion, I see its uniqueness as an intelligent being. All animals have a rich interior life full of emotions; to ignore that fact is to miss something significant we share," she says. She also travels across the United States each year, exhibiting at 12 to 15 shows and exhibitions to stay in touch with her friends and collectors and to maintain ties with the zoo and conservation communities. In these events, usually sponsored by museums, she has won innumerable "Best in Show" awards. 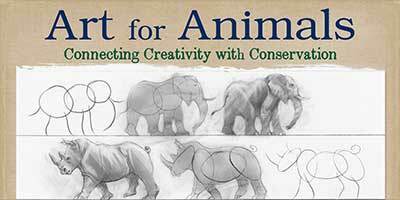 Her other achievements include the prestigious Award of Excellence from the Society of Animal Artists. She has been featured in magazines including Wildlife Art News and The Wildlife Journal. 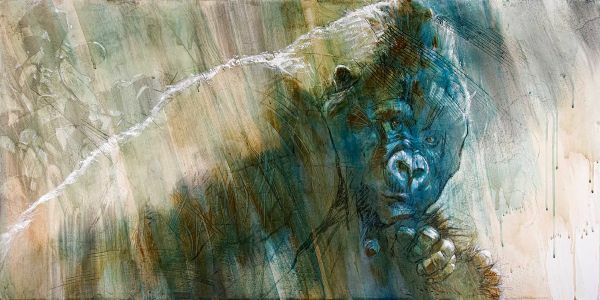 The Society of Animal Artists has selected Anne several times for its "The Art and The Animal Tour," and her work has gained critical acclaim from both the art world and the scientific community. She has appeared on Animal Planet and broadcast television programs. 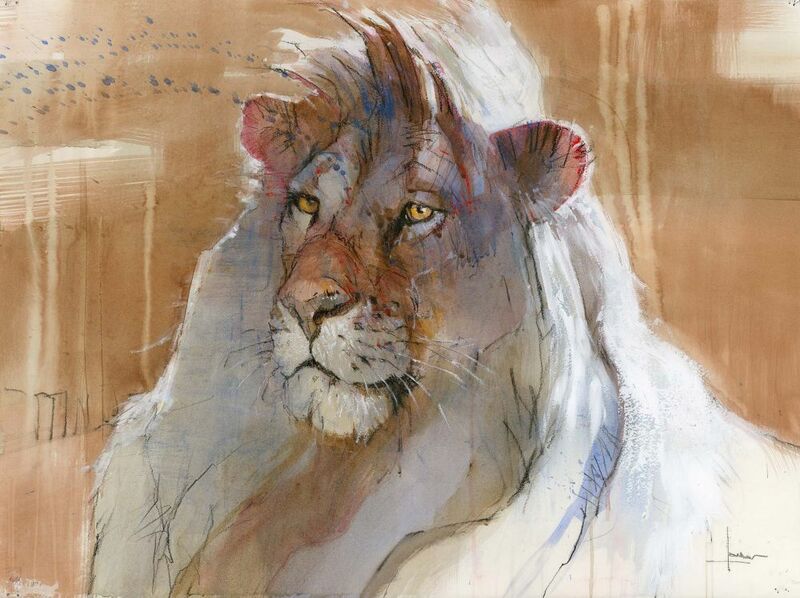 Anne's pieces inspire in viewers an instant connection with the animal's personal nature and emotions. Her years of studying wildlife anatomy in native habitats and surgeries have honed Anne's anatomical skills, but it's the intimate relationship viewers feel with the subjects that she uniquely brings to the easel. She strives to create a genuine empathy for what she calls "the other earthlings." Anne's journeys have ultimately led her to the wilds of Louisiana, where she moved to join her husband Jim Hart. Anne and Jim, both experienced travelers in Africa, crossed paths in Zanzibar in 2010 and the relationship naturally blossomed. As an oceanographer, Jim's life also revolved around wildlife and environmental action as well as art. The couple recently renovated their home -- designed with an eclectic mix of African and Asian styles -- just outside New Orleans in Mandeville, where Anne also has her studio and workshop. Anne and Jim enjoy living there with their three dogs in a natural, country environment close to "Breva," the Belgian horse Anne raised from a colt and donated to a nearby therapeutic riding facility. The couple married on horseback in 2013 during a beachside ceremony at the tip of Africa, overlooking a beautiful sunset on the Indian Ocean. Each year they travel the planet drawing and learning more about it's endangered and threatened wildlife. 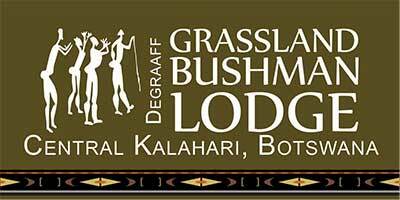 They also use these trips as opportunities to work with local children through their ARTS FOR ANIMALS program- helping the change the future of endangered wildlife by changing the attitudes of children. In 2016,they conducted an expedition to the remote south sea Island of Tonga ,to study Humpback whales and their young "in the wild"! In 2017, they treked the misty hills of Rwanda to study Mountain Gorillas, as guests of The Gorilla Doctors , and then flew east, to the hot,open plains of the Serengeti to experience and draw the great migration crossing the Mara River in Tanzania. National Fish and Wildlife, Washington D.C.
United States Fish and Wildlife Department, Washington D.C.